Our first course was a platter of three shot glasses filled with espresso, amaretto and distilled water. 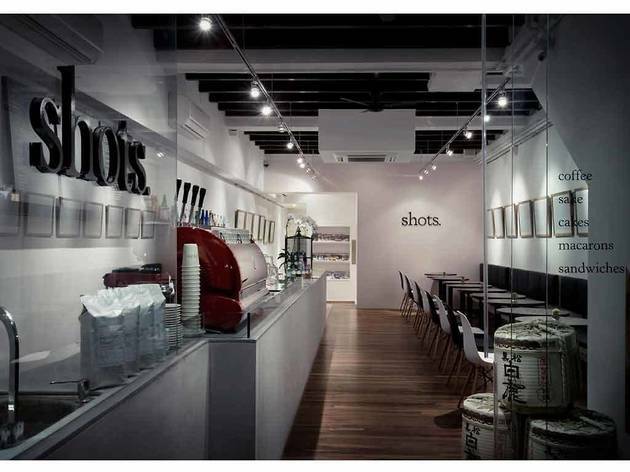 This is Shots’ version of the caffè corretto ($12.90) – an Italian beverage consisting of an espresso ‘corrected’ with a dash of alcohol. This modern take on the traditional beverage didn’t quite work: there was significantly more liquor than espresso, and the correct method of consumption – amaretto first, espresso and then a water ‘chaser’ – was not explained. This Scandi-styled Japanese-Italian café does serve some of the better sandwiches on Ann Siang Hill’s bistro-laden stretch, though. The Champagne Ham panini ($13.80), for instance, was a warm and soft brown-breaded assembly of slices of pink, bubbly-marinated ham, alfalfa and nicely salted, sautéed shiitake and button mushrooms. And although the accelerated (microwave) reheating of the frozen-beef lasagna ($8) resulted in a dish that was scalding to the bite, the hearty, tomato sauce-drenched sheetsremained intact with an even mix of chewy and melting textures. 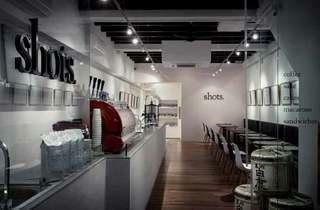 Shots, it seems, has grasped the concept of café food: its offerings are light and filling without causing sluggishness. Hard to be sluggish, in any case, after the caffeine jolt delivered by the café’s very own Tiramizu (sic) – a thoroughly whipped, mildly creamy cake.